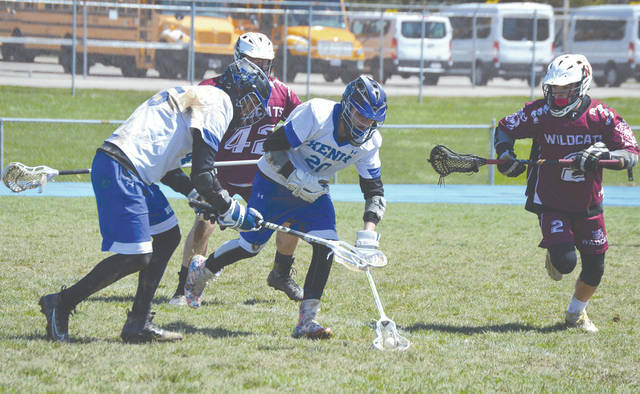 Xenia’s Tyler Dovayak (20) maintains control of the ball as Newark’s Gunner Lacroix (2) closes in, during Saturday’s April 7 boys high school lacrosse match against visiting Newark. Alex Dye (45) of Xenia fires a shot at the Newark goal during the second half of Saturday’s boys high school lacrosse match at Xenia High School. Dye scored three second-half goals in an 8-7 loss to Newark. 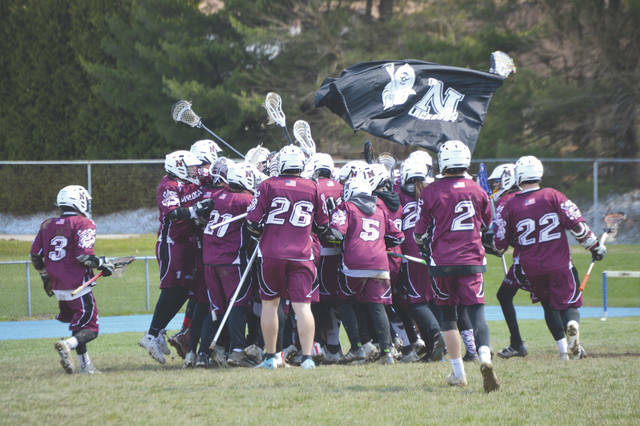 Members of the Newark High School Wildcats boys lacrosse team celebrate the school’s first-ever win in varsity competition, Saturday, April 7 at Xenia High School. The Wildcats won the match, 8-7. Xenia’s Isaac Dennehy (1) steals the ball from Newark’s Jordan Scism in the second half of Saturday’s 8-7 loss to visiting Newark. 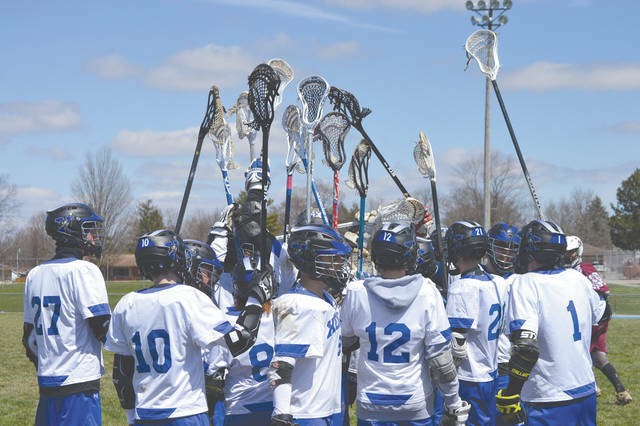 The 2018 Xenia High School boys lacrosse team breaks the huddle after a second-half timeout, Saturday, April 7 in Xenia. The team’s next home game is set for 6:30 p.m. Friday, April 13 against Chaminade-Julienne. 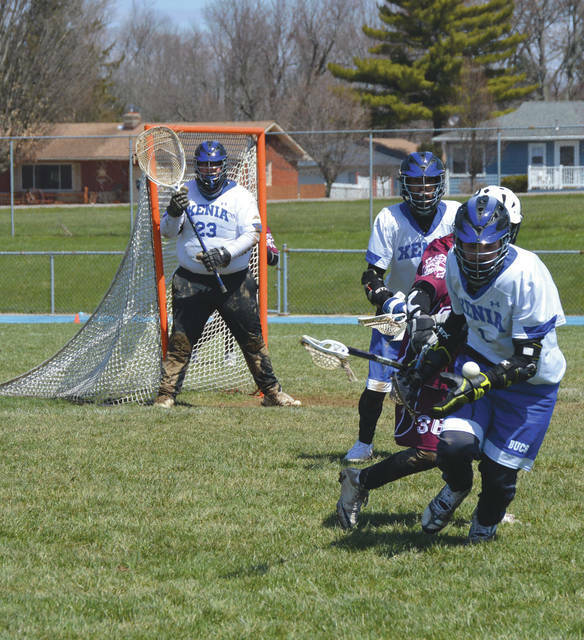 XENIA — Nobody wants to be the first team to lose to a fledgling program in any sport, but that’s where Xenia found itself on Saturday, April 7, in a boys high school lacrosse match with visiting Newark. 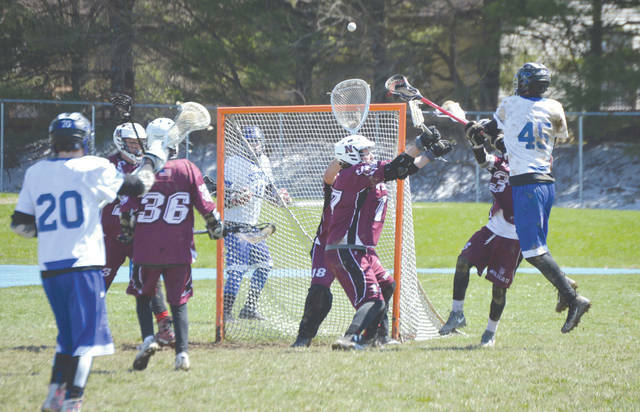 The host Buccaneers fell behind by a 6-3 score, then saw their second-half rally come up just short in an 8-7 loss to Newark, a school playing club lacrosse for its second season, ever. Players and teams are always encouraged to win gracefully, like you’ve been there before. So when the Wildcats players went crazy and celebrated on Xenia’s field, it might’ve been frowned upon by some of the Xenia players. But hey, Newark had never “been there” before! After 20 consecutive losses, Newark earned a little bit of celebration for its first win in school history. Nilo credited sophomore Becca Kalas with her first-ever goal and said attacker Joey Loughman recorded a hat trick (three goals) for the Wildcats. “It was a good overall win for us. One that we’ll never forget,” he added. The two schools will meet up again on May 4 when Xenia plays on the ‘Cats’ home field. Led by a pair of late goals from Alex Dye, Xenia pulled to within one goal of tying the Wildcats with roughly three minutes left in the contest. A series of late penalties left the Buccaneers short-handed down the stretch and seemed to kill the team’s comeback momentum, however. Despite the loss, Bucs coach Scott Dye liked the team’s effort, especially in the second half. Newark’s Nilo knew his team had dodged a late-game bullet in recording the school’s first-ever win. He credited Xenia in showing class and sportsmanship in the loss. “Xenia is a very classy team, and they’re the kind of program that we’d like to model ourselves after,” Nilo said. Nilo and his Wildcats then boarded a school bus and headed south to Wilmington High School, where they played another match later Saturday evening. Xenia was scheduled to play at Fairmont on Monday. The Bucs then head to Lebanon on Wednesday, April 12 for a 6:30 p.m. contest, before returning home on Friday, April 13 for a 6:30 p.m. contest Chaminade Julienne.